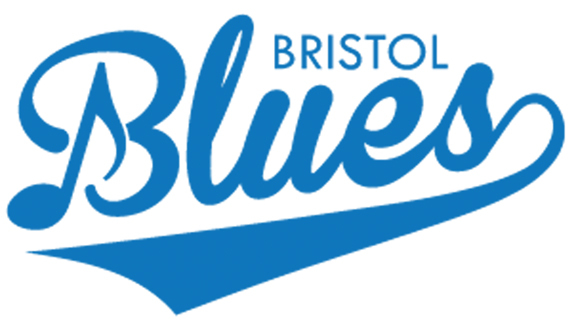 MARTHA'S VINEYARD-- Inclement weather over the weekend prompted an unexpected hiatus for the Bristol Blues, as the Saturday and Sunday tilts against the Worcester Bravehearts were called off. Playing in their first game since last Thursday, Bristol’s offense did not benefit from any of the off-days, losing 6-1 to the Martha’s Vineyard Sharks. The Blues cranked out eight hits against the top dog in the FCBL, but only mustered a single run. The low scoring totals have become a trend for Ronnie Palmer’s squad, as his team ranks near the bottom of the league in runs per game (5th), team batting average (6th), and RBI (6th). Starting pitcher Kelvin Sosa (Wesleyan) seemed determined to will the Blues to victory himself after striking out the side in the first inning. But after fanning the three Sharks in a row to start the game, the fourth batter Sosa faced jump started the Martha’s Vineyard scoring. Shark DH Eric Foggo smashed a solo home run over the left field fence to lead off the second inning, giving Martha’s Vineyard a 1-0 lead. Though that would be the only run Sosa would allow in the second, the Sharks were out for blood in the third. Martha’s Vineyard boasts arguably the most dangerous offense in the league. Leading the league home runs (16), extra base hits (59), stolen bases (63), and walks (107), the Sharks can score in a variety of ways. They showcased that versatility in the third. After nine-hole hitter Ben Dickey led off with a single, he stole both second and third on consecutive pitches. He then came around to score on a wild pitch to bump Martha’s Vineyard’s lead to 2-0. After Kai Nelson walked and moved to third on a Matt Chamberlain single, the Sharks manufactured another run. The speedy Chamberlain induced a pickoff throw from Sosa. Instead of diving back to first, Chamberlain made a beeline for second. Bristol first baseman Matt Bonvicini (UConn) fired to second for the putout, but Nelson slid safely into home plate for the Sharks third run of the day. Sosa surrendered another run on a single from Jackson Raper before finishing the inning. Sosa would then come out of the game, surrendering four runs on five hits in three innings of work. Shark starter Andrew Ferrero silenced the Bristol bats. The Blues left runners on second and third in the first, but that’s about as close as they would come to a rally all night. At one point, Ferrero retired 13 out of 14 batters faced. Center fielder Conor Nolan (Princeton), who has returned from a back injury, ended the shutout with a solo shot in the seventh. It was Nolan’s first of the year. The Sharks would add a few insurance runs in the sixth off Bristol reliever Zachary Dionne (Salve Regina). Ferrero earned the victory, tossing seven innings, giving up just one run on seven hits. He struck out nine while walking no one. Sosa took the loss, evening his record at 2-2 with a 6.60 ERA. Richard Brereton (Emory) must have enjoyed his days off, as he finished the day 3-3 with a walk. That snapped an 0-12 mini-slump. His .323 average is fourth in the FCBL. Patrick Winkel (UConn) also added a multi-hit game, as he registered a 2-3 performance. Casey Elbin (WVU Tech) and Mark Silvestri (Rhode Island) both tossed scoreless innings in relief. Bristol remains in second place in the league league standings, 3 games back of the Sharks. The Blues hitch a ferry back to mainland Massachusetts to take on the 3rd place Brockton Rox at Campanelli Stadium on Tuesday night at 7 p.m.